Printing Area: 95 X 350 mm. Printing Area: 50 X 195 mm. Nevertheless of the rich demands and copious venerations of our customers in this industry, we have been able to deliver a cherished assortment of Manual Batch Coding Machine. To mark varable information on absorbent & non-absorbent surfaces like transport cartons & H.D.P.E. Woven Sack. 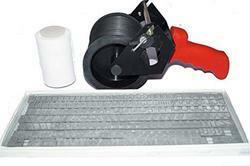 The Carton Coder Kit enables even an untrained person to simply mark 50 impressions per minute. Spring-back action marks in a single consistent movement and then returns back to zero position after each marking. The side springs maintains an even pressure on the printing area, thus ensuring clear impressions. Handy Markers are used for marking variable information like Batch No, Date of Manufacturing, Expiry Date, Name and Address of Consignor/Consignee, Product Name/Code, Shipping Marks, Net Weight/Gross Weight etc. on Porous (Absorbent) and Non-Porous (Non- Absorbent) surfaces. Usage: Used to mark or code on corrugated cartons, plywood, wooden crates, paper bags etc. Enriched by our vast industrial experience in this business, we are involved in offering an enormous quality range of Handy Marker. We are one of the leading firms offering best assortment of Hand Marker Coder. 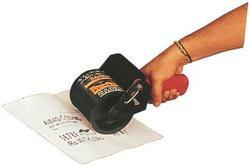 Hand Marker increases the efficiency of your marking department by making it possible to mark Cartons, Cases etc. many (5-10) times faster than any other device. It makes hundreds of impressions without Cartridge re-inking. It thus pays for itself within weeks. Light in weight, these Manual Coder are presented in the market in safe form. Durable in nature, these coders are thick in frame and easy to handle due to compact size. Besides this, these coders are optimal in finishing and remain sustained up to longer years without any maintenance.